124 Landscape Architect and Specifier News s t e w a rd s h i p Left: Partnering with the Gary Sinise Foundation, a charitable organization that focuses on supporting veterans and first responders, Landscape Development, Inc. donated time, materials and manpower to give a wounded veteran and his family a landscape for their new home in Bakersfield, Calif. Right: The home and landscape were presented to the Brubakers in a ceremony honoring the corporal's service and sacrifice, as well as the sacrifices of his family. Landscape Architect & Specifier News (ISSN 1060-9962) is published monthly by Landscape Communications, Inc., 14771 Plaza Drive Suite A, Tustin, California 92780 Phone: 714-979-LASN (5276); Fax: 714-434-3862. Online version (ISSN 2150-9123). Copyright 2018 by Landscape Communications, Inc. Printed in the U.S.A. All rights reserved. Contents may not be reprinted or otherwise reproduced without written permission. Periodicals postage paid at Tustin, CA and additional mailing offices. Subscription Inquiries: Send new or renewal notices or change of address (send both new and old addresses) to Landscape Architect & Specifier News, P.O. Box 1126, Tustin, CA 92781-1126. Subscriptions: Licensed/Registered Landscape Architects free of charge. Others, Continental U.S., Alaska, Hawaii & Canada: 12 issues, $34.95, 24 issues, $55.00, Mexico: 12 issues, $65.00 per year. Additional copies may be purchased by contacting LASN at circulation@landscapeonline.com or 714-979-5276 ext. 127. 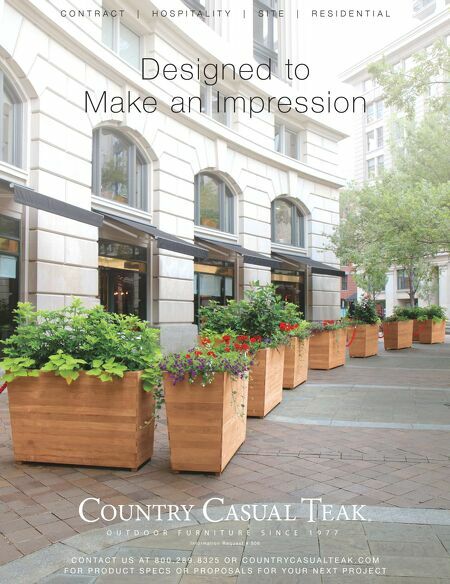 Postmaster: Please send address changes to Landscape Architect & Specifier News, P.O. Box 1126, Tustin, CA 92781-1126. 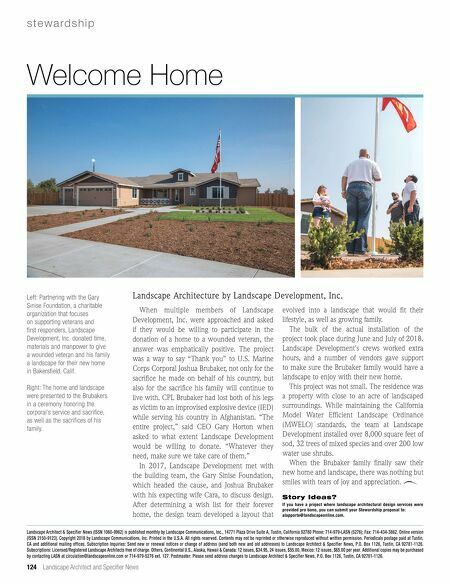 When multiple members of Landscape Development, Inc. were approached and asked if they would be willing to participate in the donation of a home to a wounded veteran, the answer was emphatically positive. The project was a way to say "Thank you" to U.S. Marine Corps Corporal Joshua Brubaker, not only for the sacrifice he made on behalf of his country, but also for the sacrifice his family will continue to live with. CPL Brubaker had lost both of his legs as victim to an improvised explosive device (IED) while serving his country in Afghanistan. "The entire project," said CEO Gary Horton when asked to what extent Landscape Development would be willing to donate. "Whatever they need, make sure we take care of them." In 2017, Landscape Development met with the building team, the Gary Sinise Foundation, which headed the cause, and Joshua Brubaker with his expecting wife Cara, to discuss design. After determining a wish list for their forever home, the design team developed a layout that evolved into a landscape that would fit their lifestyle, as well as growing family. The bulk of the actual installation of the project took place during June and July of 2018. Landscape Development's crews worked extra hours, and a number of vendors gave support to make sure the Brubaker family would have a landscape to enjoy with their new home. This project was not small. The residence was a property with close to an acre of landscaped surroundings. While maintaining the California Model Water Efficient Landscape Ordinance (MWELO) standards, the team at Landscape Development installed over 8,000 square feet of sod, 32 trees of mixed species and over 200 low water use shrubs. When the Brubaker family finally saw their new home and landscape, there was nothing but smiles with tears of joy and appreciation. If you have a project where landscape architectural design services were provided pro bono, you can submit your Stewardship proposal to: alapporte@landscapeonline.com. Story Ideas? Welcome Home Landscape Architecture by Landscape Development, Inc.